Pinatubo, National Lobster Day, mad dragons down the pants, pigeon seduction, giant flying turkeys, no soup for you. Get KGB Report via email every day (Monday-Thursday)! Click here to subscribe. Today is Thursday, June 15, the 166th day of 2017 in the Gregorian calendar, with 199 days remaining. This is the 147th day of Donald Trump's presidency. There are 1,315 days remaining in his term, assuming he doesn't resign or is otherwise removed from office. 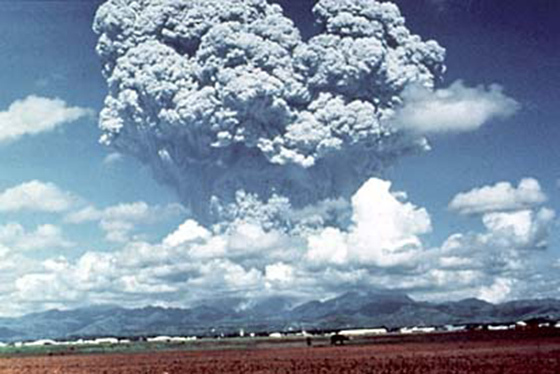 On this day in 1991, Mount Pinatubo in the Philippines erupted in the second largest volcanic eruption of the 20th Century. Over 800 people died. Among other things, today is also National Lobster Day. Florida man arrested after putting Mad Dragons down his pants. The big stories: The Arlington,Virginia shooting; Special counsel is investigating Trump for possible obstruction of justice, officials say; The London fire: what we know. Fox News drops 'Fair and Balanced' motto. Karen Pence brings 20,000 bees to the vice president's home. The Vice President isn't allowed near the hive if the queen is in residence. $1M in meth-laced lollipops seized in Houston. Investigators said they believe the sale of the lollipops, some bearing images of Batman and Star Wars characters, was aimed at children. Although I don't know any kids who would pay $20 to $40 for a lollipop. Rachel Maddow reacts to news that Alexandria shooter was a fan of hers. And here's Rolling Stone's Rachel Maddow interview. In the 1983 TV movie Special Bulletin, a terrorist group brings a homemade atomic bomb aboard a tugboat in the harbor of Charleston, South Carolina in order to blackmail the U.S. Government into disabling its nuclear weapons, and the incident is caught live on television. Which brings us to: Port of Charleston terminal evacuated over 'potential threat'. In dramatic turnabout, Southern Baptists condemn white supremacy. No soup for you. Soupman of 'Seinfeld' Soup Nazi fame files for bankruptcy protection. Google Drive will soon back up your entire computer. Relax. Google already knows everything there is to know about you. Joel Schumacher apologizes for 'Batman & Robin'. Ok, but how about 'Phantom of the Opera'? The most avid believers in artificial intelligence are aggressively secular- yet their language is eerily religious. Why? James Baldwin's FBI file runs 1,884 pages. It's full of marginalia, including this, in 1964, from J. Edgar Hoover: "Isn't Baldwin a Well-Known Pervert?" When prayer alone does not suffice. Even as Americans keep the latest victims of a mass shooting in their thoughts, they have an obligation to figure out how to prevent any recurrence. How a Philly Ob-Gyn ended up delivering a baby gorilla. Did the sun have a twin? Scientists say yes, and it may have wiped out the dinosaurs. A new study released by researchers at UC Berkley and Smithsonian Astrophysical Observatory have concluded that our sun, as well as similar stars, had twins. I dare you not to click on "Inside the Quirky World of Competitive Pigeon Seduction". Also, "Giant flying turkeys once roamed Australia because of course they did". As families of the Sandy Hook victims continue to pressure NBC to ax Megyn Kelly's Sunday interview with conspiracy theorist Alex Jones, the network has been holding crisis meetings about how to handle the backlash. Here's a handy tool with an easy-to-remember URL: www.trumptwitterarchive.com. Conveniently broken down by categories like latest tweets, fake news, losers, etc. Even Trump's aides blame him for obstruction probe: 'President did this to himself'. Trump huddled with donors on day of Comey testimony. Trump predictably abandons the AHCA- and Democrats' 2018 gift comes early..
Donald Trump is now facing three emoluments lawsuits. Poll shows most doubt Trump's respect for institutions. Trump sells Qatar $12 billion of U.S. weapons days after accusing it of funding terrorism. Trump tweaks travel ban timing. He modified the timing of his travel ban executive order Wednesday in an apparent bid to bolster his chances of persuading the Supreme Court to revive the embattled measure. Trump critics are boycotting Dolce & Gabbana. The brand trolled them with $245 T-shirts. Trump's Twitter habits have changed- in subtle and not-so-subtle ways. Trump isn't being a CEO. He's just AWOL.